The Walkers are Welcome scheme is different from most accreditation schemes. 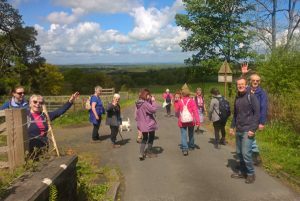 Towns and villages are encouraged and supported by the Executive Committee to become a Walkers are Welcome estination. A town or village for membership purposes is: ‘Town, parish or Community Council area except in exceptional circumstances where agreed by the committee’. Discover Britain’s Walkers are Welcome towns and villages. To download side 1 please click here. Download side 2 please click here. Gaining the status is dependent on the Executive Committee being convinced that any application is a ‘bottom-up’ initiative from within the local community. This is to ensure that there will be on-going continuity of support for the project. When applications come from Councils or other agencies, the commitment has tended to be short-term as personnel change. That is not to say that such groups cannot initiate the formation of community groups to pursue an application, and very often they provide initial funding. You may wish to arrange a meeting in your town or village to gauge support before applying for provisional membership. In which case, we urge you to contact us before any publicity takes place and we are happy to give you some advice. As soon as you feel ready, the first step is to complete your provisional membership with the online form and pay your subscription to the Treasurer. We will then appoint a mentor who will help you through the accreditation process meeting the criteria to full membership. Your mentor will also sign off your application recommending you for accreditation. Demonstrate popular local support for the concept – for example, by collecting signatures from local residents. Recommended minimum support of 50 signatures (small village), 250 signatures (small town), and 500 signatures (larger community). We expect to see approximately 5% of the population. Click on this link to download an example of a local support form. You are welcome to adapt it for your own use. Gain formal endorsement from the local council of your application for WALKERS ARE WELCOME status. This can be demonstrated by the local council (unitary, district and/or town council) passing a resolution in support, being represented on the steering group, and making a financial contribution if possible. Indicate a commitment to ensure that the local public path network will be maintained in good condition. This can be demonstrated by the local council and/or voluntary group making a commitment to ensure that paths in the town/village are walked at least once a year, that any obstacles are removed promptly, and that efforts are taken to extend the opportunities for walking. Ensure adequate marketing of WALKERS ARE WELCOME status. This can be demonstrated in a number of ways: press coverage; signs/map in the centre of town advising casual visitors of walks they can undertake; at least two waymarked walks starting from town centre; leaflets readily available; local shops encouraged to display WALKERS ARE WELCOME HERE stickers. Show how use of public transport will be encouraged. This can be demonstrated, for example, by including clear public transport advice on marketing leaflets. Demonstrate how you will ensure that WALKERS ARE WELCOME status is maintained in future. This can be demonstrated through having a well-balanced and committed WALKERS ARE WELCOME steering group from within the community. When establishing a steering group it is best practice to have a constitution and many grants require this. An example can be found here. Subject to terms and conditions as outlined in our Articles and Memorandum and policy documents. The Executive Committee consider it important there is an ongoing enthusiastic commitment from all accredited towns and villages to ensure that the above criteria are maintained year-to-year. All towns and villages are therefore required to submit an annual report each year and their subscriptions by 31st January. Failure to submit such a Return or subscription will lead to a loss of accreditation or a return to associate status within the Network.